We do not know whether Ernesto “Che” Guevara was acquainted with Mariátegui’s article. He may have read it, for his companion Hilda Gadea loaned him Mariátegui’s writings in the years preceding the Cuban revolution. Whatever the case, much of his political thought and practice, especially in the 1960s, can be said to have been aimed at emerging from the impasse to which the servile imitation of the Soviet model had led in Eastern Europe. Che’s ideas on the construction of socialism are an attempt at “heroic creation” of something new, the search — interrupted and incomplete — for a distinct model of socialism, radically opposed in many respects to the “actually existing” bureaucratic caricature. Still more explicit, especially in his post-1963 writings, is his rejection of “imitation and copy” and his search for an alternative model, his attempt to formulate another path toward socialism, one that is more radical, more egalitarian, more fraternal, and more consistent with the communist ethic. If socialism claims to fight capitalism and conquer it on its own ground, that of productivism and consumption, using the weapons of capitalism — the commodity form, competition, self-center individualism — it is doomed to failure. It cannot be said that Che anticipated the dismantling of the USSR, but in a way he did have the intuition that a “socialist” system that does not tolerate differences, that does not embody new values, that attempts to imitate its adversary, that has no ambitions but to “catch up to and surpass” the production of the imperialist metropolises, has no future. Three things express in concrete terms this aspiration of Guevara and his search for a new path: the discussion on the methods of economic management, the question of the free expression of differences and the perspective of socialist democracy. The first clearly occupied a central place in Che’s thinking, while the other two, which are closely related, are much less developed, with some lacunae and contradictions. But they are ever-present in his concerns and his political practice. Basically, the debate was a confrontation between an “economistic” view, which considered the economic sphere as an autonomous system governed by its own laws like the law of value or the laws of the market, and a political conception of socialism, in which economic decisions concerning production priorities, prices, and so on are governed by social, ethical, and political criteria. J. C. Mariátegui, “Aniversario y balance,” Ideología y Política, Biblioteca Amauta, 1971): 249. José Carlos Mariátegui (1894–1930) was one of the major Marxist thinkers of Latin America. He is primarily known for his 1928 work, Seven Interpretive Essays on Peruvian Reality (Austin: University of Texas, Austin, 1971). Letter from Che to a Cuban friend (1965). This letter is one of Che’s documents that remain unpublished. Carlos Tablada quotes from it in his article “Le marxisme d’Ernesto (Che) Guevara,” Alternatives Sud III, no. 2 (1996):168. See also, by the same author, Che Guevara: Economics and Politics in the Transition to Socialism (Pathfinder Press, 1992) and Cuba, quelle transition? (L’Harmattan, 2001). Fernando Martínez Heredia correctly notes that “… there are even some positive aspects to the incomplete nature of Che’s thinking. The great thinker is there, points to some problems and some approaches, shows some possibilities, and demands that his comrades think, study, and combine practice and theory. It becomes impossible, once one really comes to terms with his thought, to dogmatize it and transform it into a speculative bastion or a receptacle of slogans.” “Che, el socialismo y el comunismo,” Pensar el Che, (Havana: Centro de estudios sobre América, Editorial José Martí, vol. II, 1989): 30. See also Fernando Martínez Heredia, Che, el socialismo y el comunismo (Havana: Casa de las Américas prize, 1989). L’Express, July 25, 1963, 9. Ernst Bloch (1885-1977) was a Jewish-German philosopher exiled to the United States in 1938 . He became a professor at Karl Marx University in Leipzig in 1949, and at the University of Tübingen after going over to the West in 1961. From The Spirit of Utopia (1918) to The Principle of Hope (1954-1959), this unorthodox Marxist sought to restore to socialism its secular messianic dimension. Ernesto Che Guevara, Oeuvres 1957-1967, vol. 2 (Paris: François Maspero, 1971): 574. Guevara, Oeuvres, vol. 2, 371–372. Ernesto Che Guevara, “Le plan et les hommes,” Oeuvres 1957–1967, vol. 6 [unedited text] (Paris: Maspero, 1972): 90. This concept is very clear in the essay on political economy that Che wrote in 1966, from which Carlos Tablada quotes certain extracts in “Le marxisme d’Ernesto (Che) Guevara.” Janette Habel rightly observes that Guevara put “too much emphasis, in the economic criticism of Stalinist deformations, on the weight of market relations and not enough on the police and repressive nature of the Soviet political system.” (J. Habel, preface to M. Löwy, La pensée de Che Guevara (Paris: Syllepse, 1997): 11. * Michael Löwy is a French philosopher and sociologist of Brazilian origin. A Fellow of the IIRE in Amsterdam and former research director of the French National Council for Scientific Research (CNRS), he has written many books, including The Marxism of Che Guevara, Marxism and Liberation Theology, Fatherland or Mother Earth? and The War of Gods: Religion and Politics in Latin America. Löwy is a member of the New Anti-capitalist Party in France. Δημοσιεύθηκε την Οκτώβριος 9, 1967 Μαρτίου 4, 2014 από GuevaristasPosted in Ernesto Che GuevaraΜε ετικέτα Analysis,Ernesto Che Guevara,Michael Löwy,New Socialism,Socialism. In the economic discussion of 1963–1964, an important political aspect that is worth noting is the very fact of the discussion; that is, the position that the public expression of disagreements is normal in the process of building socialism, or the legitimation of a certain democratic pluralism within the revolution. This problematic was only implicit in the economic debate. Guevara never developed it explicitly or systematically, and he certainly did not link it with the question of democracy in planning. But he did adopt, on several occasions during the 1960s, a favorable attitude toward freedom of discussion within the revolutionary camp and toward respect for a plurality of opinions. The major limitation lies in the insufficiency of his thinking about the relationship between democracy and planning. His arguments in defense of planning and in opposition to market categories are extremely important and acquire new relevance in light of the neoliberal vulgate that now dominates with its “market religion.” But they leave aside the key political question: Who does the planning? Who determines the major options in the economic plan? Who determines the production and consumption priorities? Without a genuine democracy — that is, without (a) political pluralism, (b) free discussion of priorities, and (c) free choice for the population between the various economic propositions and platforms that are being debated — planning is inevitably transformed into a bureaucratic and authoritarian system of “dictatorship over needs” (as is amply demonstrated by the history of the former Soviet Union). This debate is related to the problem of the revolution’s institutions. Guevara rejected bourgeois democracy, but — notwithstanding his anti-bureaucratic and egalitarian sensibility — he was far from having a clear vision of socialist democracy. We know that, in the final years of his life, Ernesto Guevara had gone a long way in distancing himself from the Soviet model, in his rejection of the “imitation and copy” of “actually existing socialism.” But a good part of his last writings, and particularly his critical comments on the 1963 edition of the Soviet Handbook of Political Economy, remained unpublished. It is only in 2006 that these critical notes were published in Cuba. They were written during his 1965-1966 stays in Tanzania and Prague, after the failure of his mission in Congo and before leaving for Bolivia. For four decades this document remained “invisible,” although after the end of the USSR some Cuban researchers were allowed to consult it, and take a few notes. It is only now, some 40 years after their writing, that it was decided to publish them in Cuba, together with other unknown documents from the same period. Why were Geuvara’s notes not published earlier? One can, perhaps, understand that, before the end of the Soviet Union, there could have been some (bad) diplomatic reasons to keep them hidden. But after 1991, what “danger” could these notes represent? Who decided that they should be kept in a drawer? Who finally gave the “green light” for the publication? In any case, at last this material is available to interested readers, and it is really quite significant. It documents his intellectual independence, his distancing from the Soviet model of “actually existing socialism,” and his search for a radical alternative. As in the earlier debate, Guevara defends planning as the key element in the process of building socialism, because it “liberates the human being from his condition of economic thing.” But who should make the plans? One can consider these notes as an important stage in Guevara’s path toward a radical alternative to the Soviet (Stalinist) model. In October 1967, the assassins’ bullets of the CIA and its Bolivian accomplices interrupted this work of the “heroic creation” of a new revolutionary socialism and a new democratic communism. 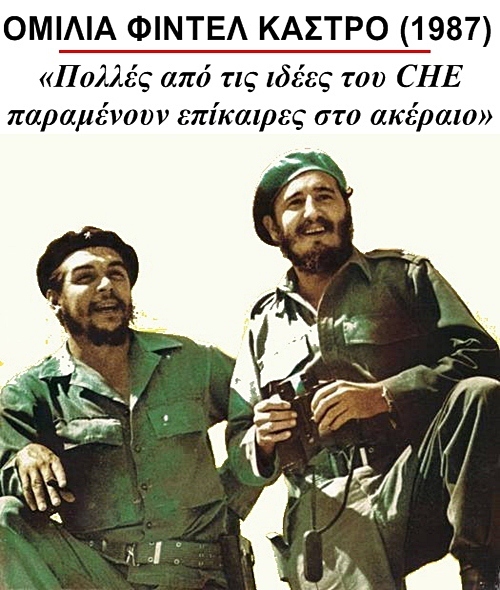 “Interview with Maurice Zeitlin,” in R. E. Bonachea and N. P. Valdes, eds., Che: Selected Works of Ernesto Guevara (Boston: MIT Press, 1969): 391, and “An Interview with Roberto Acosta Hechevarria,” in Gary Tennant, The Hidden Pearl of the Caribbean: Trotskyism in Cuba (London: Porcupine Press, 2000): 246. According to Roberto Acosta, Guevara told him that at some point in the future Trotskyist publications would be legal in Cuba (249). Che Guevara, “Il piano e gli uomini,” Il Manifesto, no. 7 (December 1969): 37. Guevara, Oeuvres 1957-1967, vol. 2, 379. Quoted by Juan Antonio Blanco in Tercer Milenio, una visión alternativa de la posmodernidad (Havana: Centro Felix Varela, 1996): 56. Guevara, Oeuvres 1957-1967, vol. 2, 369, 375. Tablada, “Le marxisme d’Ernesto (Che) Guevara,” 173. Ernesto Che Guevara, Apuntes criticos a la Economia Politica (Havana: Ocean Press, Editorial de Ciencias Sociales) 2006, 132–133. The article by Michael Löwy was published first in Against the Current 142, September-October 2009. Retrieved from the International Viewpoint. Δημοσιεύθηκε την Οκτώβριος 9, 1967 Μαρτίου 4, 2014 από GuevaristasPosted in Ερνέστο Τσε ΓκεβάραΜε ετικέτα Analysis,Ernesto Che Guevara,Michael Löwy,New Socialism.